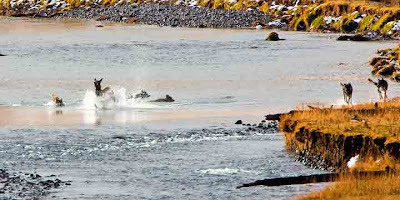 Here is another photo of the Druid Pack of Yellowstone Wolves as they try to catch a cow elk in the Lamar River last fall. The elk eventually escaped. These wolves are infested with Mange, (a parasitic mite that causes their hair to fall out) which decimated this pack. All of the wolves in this photo died this past winter. The park wolf biologists helped destroy this pack by radio-collaring 7 of the 14 adults. They chase the wolves down with a helicopter and then dart them with paralyzing drugs to put the collars on. Then they refuse to treat the wolves for Mange because it is "Not Natural".